Such a large part of our food enjoyment is visual, it’s no surprise that restaurants take a great deal of effort in choosing their crockery, and chefs understand that food needs to look good as well as taste good. Please don’t think that I’m saying theses salads are all style over substance, but I do think that our culinary experience is improved when our food looks it’s best. This is another of my recipes that are not really recipes; more of an assembly process. My original inspiration was Amelia Freer’s first book Eat. Nourish. Grow. But I’ve made them my own and I encourage you to do the same. 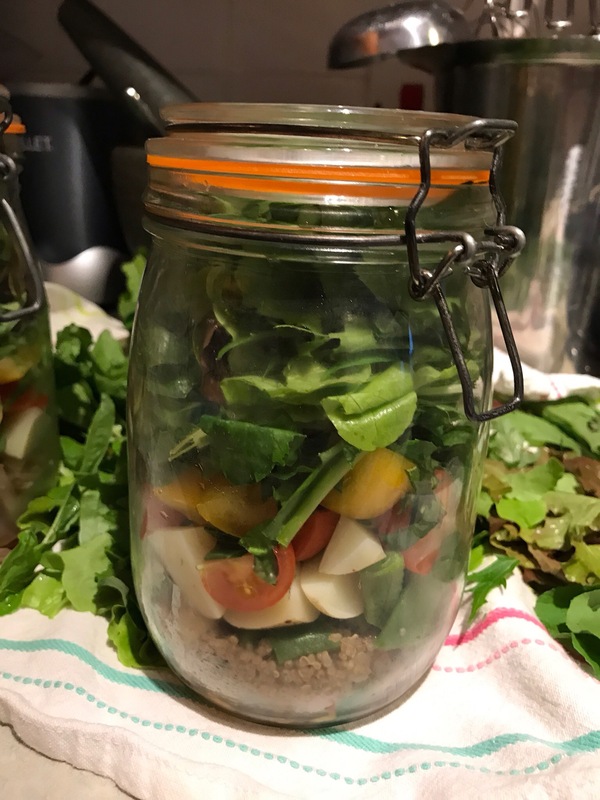 If you can get hold of large killer style jars or pots then they make these layered salads look pretty and your colleagues or flat mates will have lunch envy when they spot them in the fridge. As with many of my assembly type recipes there are a few rules then you can freestyle at will. You can put the dressing in a separate container, but I tend to just put it at the bottom and then shake the jar vigorously before eating, if you put the protein on the bottom then it will sit and marinate in the dressing which can never be a bad thing! Remember that the juices from things like tomatoes will run into anything below, and if you are using delicate leaves such a s rocket I recommend you put them at the top. Try to include both protein and carb (grains, potatoes, pasta) this will make sure your salad jar isn’t a zoolander salad and has some substance to keep you sated all afternoon. Just like my Posh Noodles in a Jar I try to theme my salads, but more often than not they are just made up from whatever ingredients I happen to have in at the time. Here are some ideas from ones I’ve created. Let me know what your favourite combination is!